Here is an opinion piece that I submitted to Business Day some weeks ago, written from my own viewpoint as an environmental governance activist and from the perspective of that paper’s readership profile. As it has not been published, I thought I would publish it here – as submitted – given the rising debate in South Africa over rhino horn trade. Hopefully, it will add some value to the conversations. There’s a growing voice to lift the global ban on rhino horn trade and an investment analyst, Michael Eustace, is a high-profile, South African promoter. His seemingly compelling argument was published in Business Day (Rhino poaching: what is the solution? January 20). For me, as a concerned citizen – and conscious of our national species’ custodial obligations – five key issues arise. Firstly, I believe it’s critical to define the globally-accepted litmus test for any national, environmental decisions. In a landmark 2007 Constitutional Court ruling (known as the Fuel Retailers case), Ngcobo J was clear that the National Environmental Management Act of 1998 “requires ‘a risk averse and cautious approach’ [that] entails taking into account the limitation on present knowledge about the consequences of an environmental decision”. Internationally, this tenet is called the “precautionary principle”. Our former Chief Justice explained it as being “applicable where, due to unavailable scientific knowledge, there is uncertainty as to the future impact of the proposed development”. He stated that “authorities [need] to balance environmental needs and environmental concerns [as this] is the principle of sustainable development”. Given such legal precedence, methinks Eustace (and others) should present a more comprehensive scenario that includes risk and threat analyses to counter their upside, commercial revenue projections. Secondly, Eustace is highly critical of CITES (Convention on International Trade in Endangered Species of Wild Fauna and Flora). Their 175 member states regulate global affairs and defined rhino trade from 1977. Of their trade embargo, he states that “while well intentioned, the ban has been a miserable failure”. Southern white rhino research in 1999 by two internationally respected scientists, Emslie and Brooks, noted “it is currently the most abundant subspecies of all rhinoceros taxa and its recovery has been recognised as one of the world’s greatest international conservation successes”. From 2000 to 2007, on average, 15 rhino were lost to poaching annually, 30 times less that the gut-wrenching, bloody stats of 2011. A CITES report records SA’s population in 2009 at about 18 000 rhino (roughly 200 times more than when the ban began) as a result of a decade’s annual growth average of 6,6% p.a. Personally, I struggle to find a “miserable failure” in a 30-year triumph. In analysing mitigating factors of current poaching properly, independent researchers should study, inter alia, ‘pseudo-hunting’ (from 2003, via ‘rogue’ hunters), poor law enforcement and weak permit management (locally and internationally), the rapid growth of Far Eastern regional trade, investment and foreign employment, high growth in improved transit routes and telecommunications, and local corruption allegations. The third issue is that SA holds almost 90% of Africa’s rhino population. Given abnormal premium pricing for horn, objective comparisons with other species facing similar threats must be undertaken, scientifically. For me, two similar examples are caviar (sturgeon) and ivory (elephants). The Caspian Sea is home to about 90% of global sturgeon. Despite united and concerted efforts by regional law enforcement agencies of the 5-nation sea-neighbours to stop illegal poaching over the last 3 years – mainly driven by large criminal syndicates – this species’ future is now threatened. Russia’s called for a 10-year moratorium on all fishing and Iran recently gazetted a 5-year ban. ‘Raw’ ivory is altogether different, since global trade is banned. From 2003, increased poaching and illegal trade led to certain states, including SA, being allowed to sell ivory in 2008 to China and Japan, via auctions, to counter strong, pent-up demand. However, 2009’s 16 tonne interceptions of large illegal shipments (i.e. those over 800kgs) was trumped by an all-time record of over 23 tonnes in 2011. These two premium-priced species’ examples highlight genuine global management efforts to meet consumer demand being undermined by sophisticated criminal activity. Other examples exist. International conservator role-players now mistrust managed supplies for any demand of premium-priced, threatened wildlife. Fourthly, legalizing rhino horn trade is promoted for its status to meet traditional Chinese medicine (TCM) demand. However, this is somewhat fallacious, given China legislated a rhino horn ban in 1993. Vietnam and many other key south-east Asia countries later followed suit. Rhino horn was officially removed from TCM’s pharmacopeia. Substantial international NGO and multilateral agency funding for China and other TCM markets has promoted more responsible and ecologically sustainable use of wildlife for over a decade. No evidence exists that promoters of legal horn trade have formally approached China, or other states, for opinion as to their positions on amendments to laws permitting horn trade. It would be quite laughable if, for example, SA decided to legalize marijuana (dagga) and built a business model around exporting it to meet pent-up medicinal demand in, say, the USA (where it’s currently outlawed) without bilateral discussions first. My analogy isn’t different from the principle of supplying TCM demand where rhino horn has been illegal regionally for almost 20 years. Furthermore, hundreds of wildlife species’ ingredients are banned in TCM. There’s no known precedent whatsoever for the re-introduction of a premium ingredient (such as horn) in TCM compounds after lengthy trade embargoes. Questions arise when assessing collateral damage for other banned species that might be publicly misconceived to be similarly now ‘unbanned’. Thus, related trade officials must apply the “precautionary principle” in their decision reviews, given an absence of knowledge for future, consequential damage. Fifthly, SA Tourism recorded approximately 1,5m non-African arrivals, Jan-Sept 2011. A fair assumption would be 2m annual visitors. At current levels, the average inter-continental visitor spends roughly ZAR 11 000 (about US$ 1500) per visit. With SA’s growing international media exposure for poor environmental governance over poaching, coupled with increasing criticism in social media over calls to legalize horn trade, plus government’s drive to grow eco-tourism, there’s clearly a risk that poor, sensitive decisions will impact on future overseas arrivals. If arrivals drop by, say, 1%, then 20 000 annual overseas tourists are lost – i.e. R220m in revenue losses, at current pricings – each year. One therefore must evaluate expensive global marketing of a Big 5 experience, which would include viewing dehorned rhino, plus any associated costs for additionally marketing such explanations. 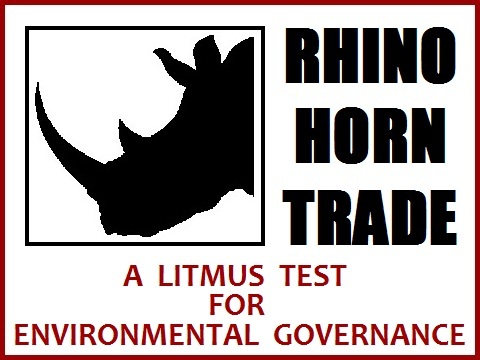 Eustace wrote that the SADC Rhino Management Group asked the Department of Environmental Affairs (DEA) to motivate a CITES trade ban lifting in 2013. Dr. Mike Knight, the group chairman, refuted such a claim in the Saturday Star on 3 December 2011 after Pelham Jones, chairman of the Private Rhino Owners Association, was quoted making a similar claim. Jones also claimed the DEA and TRAFFIC – the international monitoring group for wildlife trade – supported trade. Subsequently, both parties refuted his claims. To conclude, I believe it’s vital for rhino security that objective dialogue continues, to find smarter, optimized solutions. I’m not opposed to trade, if there is compelling, scientific justification. All I seek is a ‘risk averse, cautious approach’. Ngcobo J’s wise counsel rings in my ears again when he recounted the Global Judges Symposium’s Johannesburg Principle where delegates affirmed they’d “spare no effort to free all…from the threat of living on a planet irredeemably spoilt by human activities”.